As a native of Northern California, I truly miss the seasons up north. Especially in the fall, when the weather is crisp, and the leaves are turning gorgeous shades of red, orange and yellow. Now as a resident of Southern California, I have to travel a bit further to see the autumn leaves and take in the cooler weather, but it is still humanly possible! 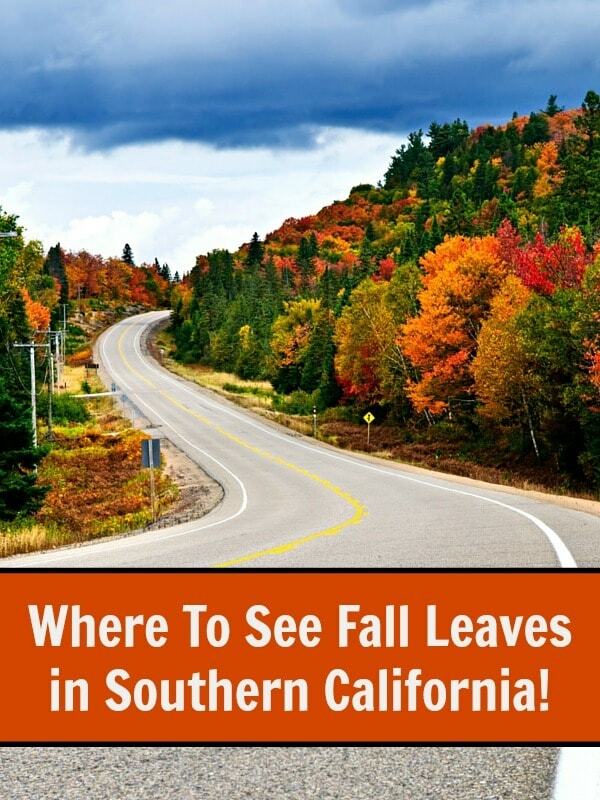 With most So Cal locals living near the coast, we have to travel to a leaf peeping area at just the right time of year or we miss the foliage. Luckily for us though, fall color starts in August at around 10,000 feet and drops elevation by elevation at a rate of 500. So by late October, early November, fall foliage is peak in Southern California. Here is a list of Southern California’s favorite leaf peeping spots which vary in elevation, time of peak and when colors are at their most intense. At the LA County Arboretum & Botanic Gardens, sour gum, chinaberry, Jerusalem thorn, eastern redbud and maples fill with yellow, golden, orange and crimson colors in late October, early November. Nearly every ecosystem, from swamps, to forest, to desert, is naturally represented at the Whittier Narrows Recreational Facility, where the San Gabriel and Rio Hondo Rivers diverge. Stop by the ranger station any day from sunrise to sunset for information on the plant and animal life that inhabit this nature reserve. If you’re looking for fall colors in Southern California and some nice views on a clear day without a ton of work, one great choice is Stoddard Peak located right below Mount Baldy. The hike itself is just over 6 miles and just under 1,000 feet in elevation. Mount Baldy is located off the 210 freeway at Baseline exit. You do need to purchase a National Forest Adventure Pass to park anywhere. Just a short drive from Los Angeles, Big Bear Lake is nestled among the trees in the San Bernardino Mountains. In the fall, the changing colors contrast dramatically against the many evergreens in the area. The Woodland Trail is a family-friendly 1.5-mile loop that starts at the Big Bear Discovery Center and is a great place to see fall foliage and the lake below. The prime time to see the changing leaves are Mid-October through early November. The best views are from the hiking trails north of the lake. Grass Valley Lake is a reservoir located just 1.9 miles from Lake Arrowhead and home to beautiful scenery, especially in the fall. Here you will find black oak and Fremont cottonwood trees and pockets of aspen providing orange, buff, gold and yellow splashes of color among deep green pines. Large cottonwood provide a golden canopy to the campgrounds at Lake Hemet in the San Jacinto Mountains. Best chance to see fall leaves is to camp beside the lake surrounded by intense fall color. Weather permitting, the peak lasts for approximately two weeks. A beautiful remote area with ample amount of apple orchards whose leaves blend with California black walnut and oak trees. You can also drive a 5-mile loop around the orchards to see the foliage. Located off Interstate 15, east Highway 138, past Highway 143 out of Hesperia, the Silverwood Lake State Recreation Area, features a nice autumn vista of black oaks nestled in pines. This beautiful park offers camping and hiking in an oak woodland forest, with a sprinkling of pines and lovely meadows with creeks. There are over 100 miles of trails which accommodate hikers, bikers, and equestrians. The main fall color tree in this State Park is the black oak. The leaves often turn a nice golden yellow. In a wild and lonely corner of the Los Coyotes Reservation stands the highest point in San Diego County. Hot Springs Mountain, which stands about 20′ higher than Cuyamaca Peak, boasts the stunning views you would expect from a 6,533′ mountain smack dab in the center of the Peninsular Ranges. Beyond those views, the mountain’s elevation supports a dense forest full of a variety of conifers interspersed with deciduous black oaks, whose leaves turn a brilliant gold during late October and early November. Located off Highway 76, up Highway S6, left on Highway S7, at the junction near the peak. This State Park features a nice autumn vista of bracken fern in the meadows turning a rich golden brown against the dark green of adjacent forests. Located in eastern San Diego County, Mnt. Laguna is home to black oak tree which display a vivid mix of green, lime, yellow, orange, gold and buff. There is also a vast meadow and a lake, which seem out of place in San Diego’s semi-arid back country. Just an hour northeast of San Diego, Julian is a quaint old mining town where you can see fall foliage in Southern California. Fall foliage is unusual this far south, but Julian’s apple orchards offer a chance for leaf peeping late in the season. The prime time to see the leaves changing is late October into early November with the best views are among the apple orchards. Does anyone know where to go for Fall leaf color on the Central Coast, Santa Mariato Paso Robles area? You missed Idyllwild, 9 miles up the mountain from lake Hemet, and much, much more beautiful and full of color. Thank you thank you! I’m a so cal native and resident, but ever since I came home from college in Boston, I get foliage withdrawals! I can’t wait to see some pretty leaves! Hi, do you know the best time to see colors in Idyllwild? End of October, early November.